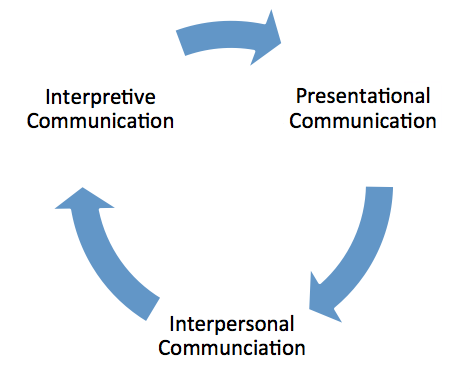 To maximize learning, the three modes of communication must be considered as three parts of a single goal: communication. Keep the visual images of the NAEP and the Wisconsin model in mind. It is possible to consider the modes separately, but their strength is in their interrelatedness. Keep in mind also, that assessing the interpretive, interpersonal and presentational modes in a standards-based integrated performance assessment occurs throughout the unit of instruction, not necessarily at the end of instruction. The building blocks of related grammar and vocabulary will be formatively assessed throughout the instructional unit providing feedback to both students and teachers about how well the students know and can use the target language. The unit is not finished with the completion of the poster. What can the students do to meet the criteria of the Interpretive mode? They could explore a variety of travel brochures and websites about places where the target language is spoken. As a final interpretive assessment, students could demonstrate understanding of a travel brochure in the target language by checking off statements on a worksheet that are true about the place described in the brochure, highlighting on the brochure where the information is found. In the Interpersonal mode, the brochures or posters produced by the students could be the basis for a discussion about what places the students would like to visit and why. Students could sit in pairs to discuss. The teacher can monitor the discussion while students could be asked to complete a peer assessment sheet after time is up. By looking at a project through the three modes of communication, the opportunities for students to use the language related to the theme multiply. Because the three tasks are interrelated, the learning links in the brain are strengthened. And all three modes of communication are valued in the assessment.